Balloons for Cash – Make Money as a Balloon Twister! It really isn’t hard to start making real money really fast with my new program. Just take a look at an event I did last summer. I made over $600 in CASH in just 2 days! Now that is real income! 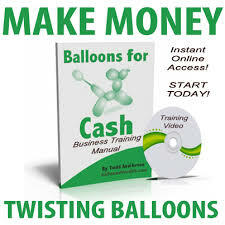 I have created a book and online video training course that you can complete in a few weekends and you too can be making money twisting balloons! It is the only product on the market that takes you behind the scenes in the business and the art. This is not hard to do and, when you follow my simple instructions, you make money too! Just a little on the side or turn your passion into a full time income! Balloons for Cash was written by Todd Anderson and was published by Studio 43, LLC in partnership with Eric Michael Roberts and is designed to teach you the balloon and business aspects of being a successful balloon twister. Because of that, when you start today I am giving you three more bonuses… including this marketing ebook, my full online web site build script and 50% off Eric’s private Udemy course where you see my entire site being launched and boosted to the top of google search so I can get so many gigs!